Enclosure box 240х190х90mm, IP56, OLAN, gray Enclosure box with protection grade IP56. Enclosure box VB-AG-1914, 190x140x70mm, IP66, grey Enclosure box VB-AG-1914 with dimensions 190x140x70 mm, grey colour. Enclosure box VB-AG-1115. 150x110x70mm, IP66, grey Box, plastic, without openings IP54 gray universal dimensions: 150 x 110 x 70 mm and a degree of protection IP54. Box OL 20013, plastic, with holes - 10, gray, 190x140x70mm Gray plastic box with 10 holes, OL 20013, 190 x 140 x 70 mm. Box with holes 100x100x50mm IP55 OL20011 Box 100 x 100 x 50 mm, is designed for surface-mounted internal communication lines. 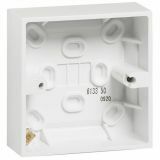 Surface mounting box, LEGRAND, Belanko, 613350,1 gang, white 1 gang, white, plastic surface mounting box for boiler panels from LEGRAND, Belanko confomed to BS standard with depth 35mm. Junction Box PK 120x100x68mm Junction box, panel mounting. Degree of protection IP 54. Junction box PK 180x140x125mm, outdoor mounting Junction box for outdoor mounting. Degree of protection IP 54 when installing the nozzle type A is reached degree of protection IP 65. Junction box for outdoor installation, with cover, black, PVC, 72x72x33mm Junction box for external mounting with dimensions 72 x 72 x 33 mm. List Price: 1.10лв. VAT Incl. 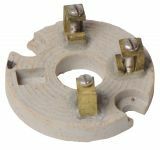 Vikiwat Ltd. is a direct importer of junction boxes and accessories for mounting under plaster, plasterboard, concrete and volume mounting. 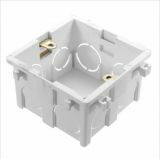 Junction boxes and consoles, designed for embedding, have different sizes, inserts, covers; they are single, threefold, fourfold, fivefold, produced from leading manufacturers, round or square, made of self-extinguishing PVC.